I'd like some suggestions and ideas about what I've already done. For those who've seen the padded cell I did, it's part of that map. * The checkered floor is used as a reference. It doesn't show up in-game. * The office is what I worked on the most. * I'd like some ideas for the actual corridor. At the moment, I feel like it might be too wide to seem realistic. I'm open to just about anything including good reference pictures which you personally found convincing. The corridor tiles are blinding and distracting, I think the colours need to have way less contrast. I think the tops of the wall might look better being dark. As a midtone, they blend into their surroundings, and are thus weaker in their job of visually separating rooms. A plain "black" wall-top might look more plain, but I think it would be much more effective. The textureless walls feel a little out of place with how detailed the floors are. I think the floors should be simplified in general. If you really want a high-detail look, it's usually better to have the detail in the walls and keep the floors simple, since characters will usually be overlapping the floors and need to be easy to see, while the walls are usually not overlapped as often and thus don't hinder legibility as much. You can create more visual interest and help erase the pixel grid by having floor patterns that are diagonal or otherwise avoid straight horizontal/vertical lines. Even in real architecture, floor tiles/panels/parquet are usually laid in such a way that they're not parallel with the walls, to make them look less boring (bathrooms seem to be the most common exception to this, perhaps because there the tilework is purely functional). Try to avoid having all your props be perfectly parallel to the tile grid, as well. 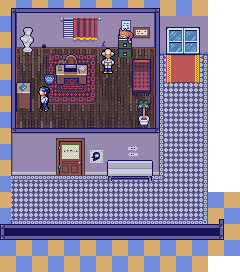 Rotate stuff slightly within the confines of its tiles, it'll look way more real and organic. Doing this to all the props would look messy, but doing it to some should really help. Lastly, don't forget about worldbuilding. Don't place props just where there's space. Think about how the room is used, and by whom. Would they really want the couch to be perfectly parallel to the wall? Would they really put that statue there, where neither the person at the desk not on the couch can see it? Would they put the filing cabinet there, and not somewhere a little closer to the desk but further away from the patients? The statue says something about the user of the room, but that something is not reinforced or clarified by any other props, surely you can do more with that.